Jodie Swallow successfully defended her Ironman 70.3 South Africa title. 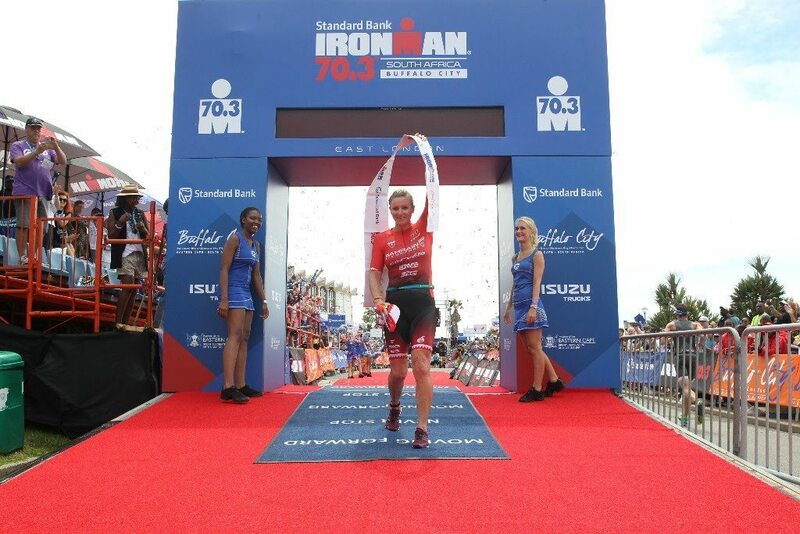 It was a triumphant start to 2016 for Jodie Swallow as she successfully defended her Ironman 70.3 South Africa title. Her sixth win in as many starts, the British world champion triathlete also set a new course record despite a tough swim and rainy conditions. Swallow’s trademark aggressive swim took her to the lead from gunstart, exiting the water with more than three minutes’ lead. On the bike, she grew her lead to 10 minutes. Swallow continued to fly through the run, gapping her competitors by almost 19 minutes as she broke the tape in 4 hours, 23 minutes, and 28 seconds. James Cunnama came up against a test of form versus his South African compatriots, Kyle Buckingham and defending champion Matt Trautman. Spending most of the race chasing from the swim through the bike behind the men’s leaders, Cunnama took off on the run and battled Buckingham for the runner-up finish in the closing kilometers. Narrowly outsprinted by one second, Cunnama took the final spot on an historic all-South African podium.